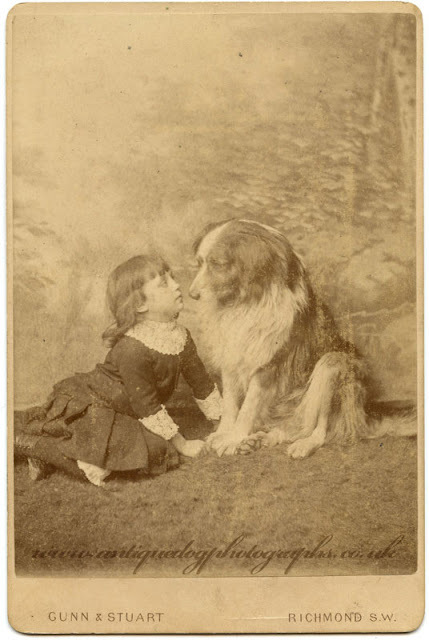 This is a truely tender portrait, the close relationship between child and Collie is quite obvious as they gaze into each others eyes in this photograph. It was taken at No2. The Quadrant, Richmond, London. This was, and still is, an impressive and beautiful building as you can see in the images below. 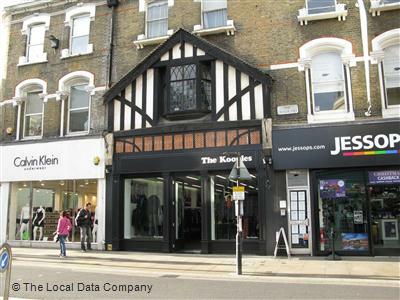 Interestingly at the time of writing Jessops the photography shop is now situated next door to No2. 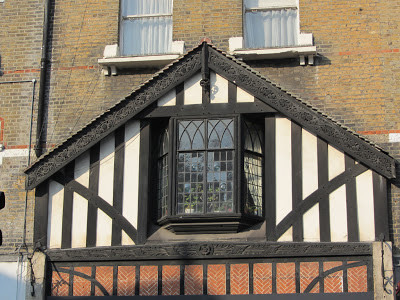 The studio of Gunn and Stuart was a partnership between Charles James Angel Isaac Gunn and his brother-in-law William Slade Stuart, between 1894 and May 1902. William worked as a Linen Draper's assistant (cloth seller) before becoming a photographer. Not long after the Studio partnership dissolved Charles became bankrupt in the November of 1902. He had run up huge debts mostly incurred through lavish expenditure on a house in Richmond. He was born in April 1857 in Homerton, Hackney, London, the son of James Gunn and Rebecca Andrews. In 1886 when aged 26 he married Annie Maria Tuckwell, they would go on to have 5 daughters and 4 sons. Here you can see Charles the "Photographic Artist" and his household in 1901, including his niece Alice Allehouse (who was working for Charles as a Photographic assistant), his then elderly mother Rebecca and two household servants. Click the image to enlarge. Source Citation: Class: RG13; Piece: 679; Folio: 25; Page: 1. Source Information: Census Returns of England and Wales, 1901. Kew, Surrey, England: The National Archives, 1901. Data imaged from the National Archives, London, England. Charles became a member of the Photographic Society (later The Royal Photographic Society) from 1889, and earned a Royal Warrant for the studio on September 24 1896. Not long after obtaining their Royal Warrent the Studio photographed the Queen for a Diamond Jubille Portrait, which you can see here.